MarketWarrior (5.2018.12.26) – upgrade is available for download on the Owner’s Page. This version is also available on the 30 day free trial page. This version has added support for Alpha Vantage data service. Read about Alpha Vantage here. If you own MarketWarrior 5 the upgrade is on the Owner’s Page. We will send you the ETN price quote and our public wallet address. Most orders processed in 1 day after the ETN is received. On December 4, 2018 Quandl gave notice they were acquired by NASDAQ exchange. For MarketWarrior 5 users who are using Quandl data service we do not know what changes are coming. We will post all new information here. We are finishing work on support for the Alpha Advantage data service and hope to have that done this month. 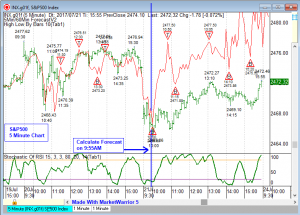 In this blog I am going to show how to use MarketWarrior 5’s automatic forecasting tool for the 5 minute chart. I am going to be using the S&P500 symbol from Google Finance, LNX. I will also be using the NIFTY50 symbol $SPIR from Barchart.com. 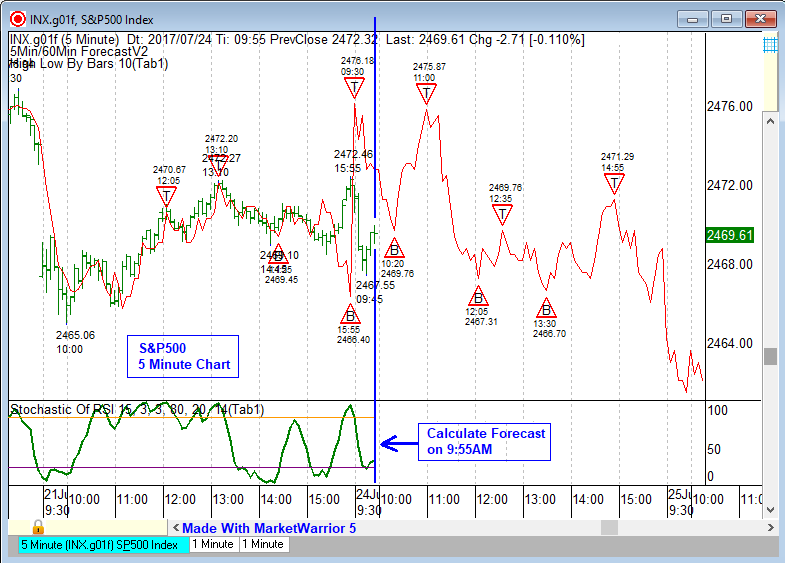 The forecasting tool we are using is applied to a price chart by clicking the button labeled ‘5/60Min Forecast’. This is show in the first picture below. The blog will cover July 20th to 24th. 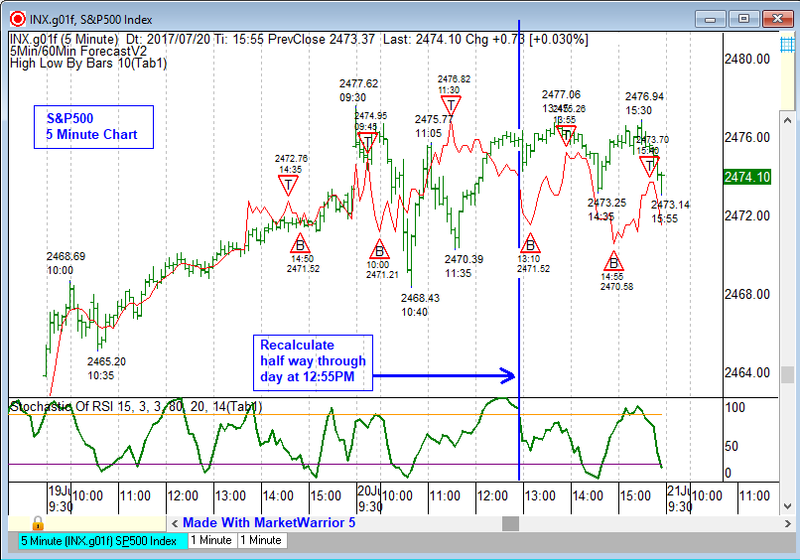 The picture below shows the 5 minute chart for the S&P500 using the symbol LNX. This S&P500 symbol has data from 9:30AM when the main trading session opens in the US to 3:59PM when the main trading session closes. 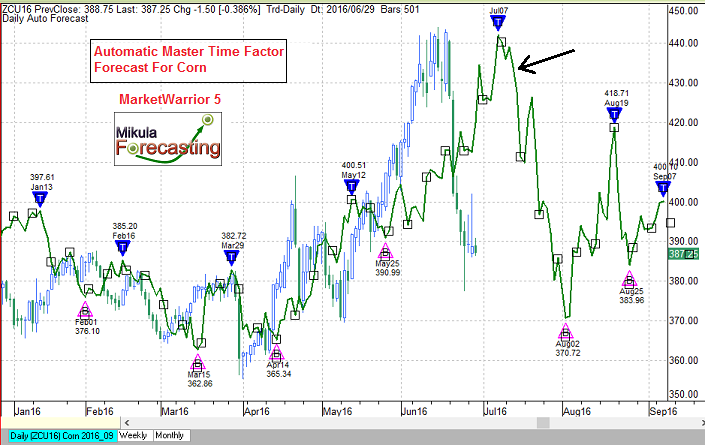 The MarketWarrior 5 automatic forecasting tool has been applied to the chart below. The forecast can be recalculated as often as you want or not at all. When I use this forecasting tool I do not recalculate very often, usually from zero to two times a day and that is all. On the chart below I have added the forecasting tool at 9:55AM on July 20, 2017. I have added a blue vertical line marking the time 9:55AM when the forecast was made. I usually select a time close to 10:00 AM because I want the opening gap and the first few bars to be included in the forecast calculation. 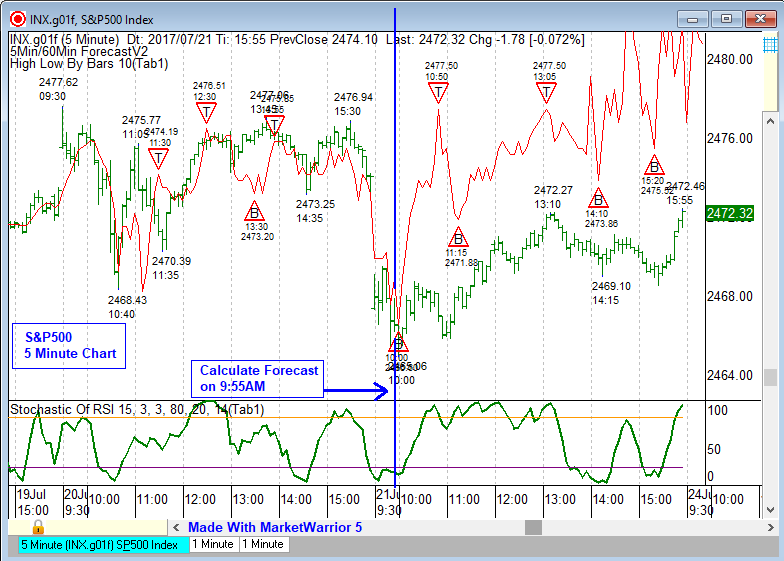 The forecasting tool is converting the recent price action into a cycle and is then extending the cycle forward. On the chart below you can see the price action for July 19, 2017 was upward sloping with almost know counter-trend declines. This usually results in the next days forecast showing a strong up move. This is what happened on July 20, 2017, the forecast made in the morning at 9:55AM was a strong up move. The next chart shows the 5 minute chart about half way through the day. The price action did not follow the forecast and there was no trade to be made. When I am recalculating a forecast I only do it a few times a day. If the forecast is wrong and the market is not following then there is nothing to trade. 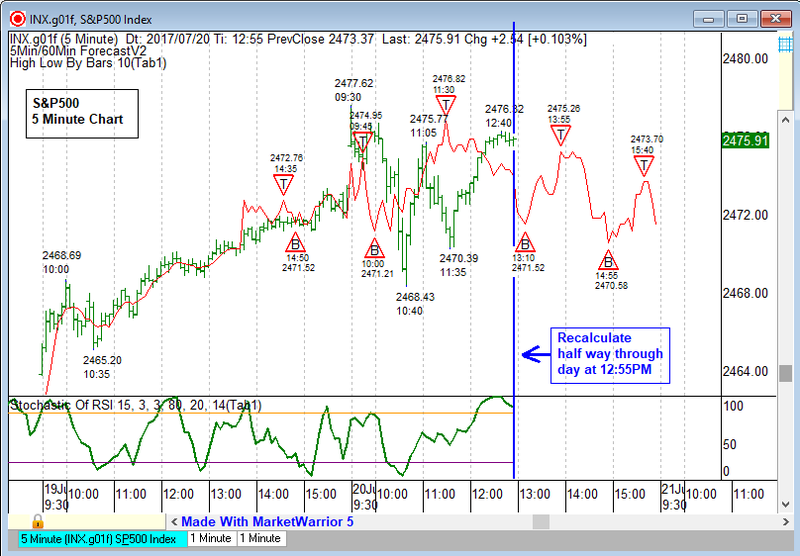 I like to recalculate a forecast half-way through a trading day for the market I am looking at. In this case between 12:30PM and 1:00PM represents halfway through the trading day. The chart below shows the errant forecast with the price data through 12:55PM. On the next chart I am going to recalculate the forecast. The picture below still shows July 20, 2017 and I have now recalculated the forecast at 12:55PM. The new forecast shows the remainder of the trading day which is three hours from 1:00PM to 3:59PM. There are now four forecast turning points. Two bottoms and two tops. The final two charts show how this worked out in the second half of the day. 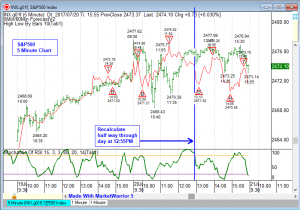 The pattern of two bottoms and two tops with a decline into the end of the main trading session did in fact occur. The forecast for the second half of the day was accurate. 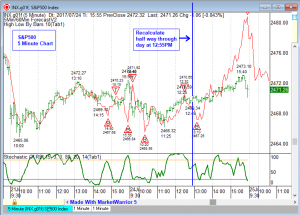 The green indicator in the sub-chart is the ‘Stochastic of RSI’ which is one of the better momentum indicators for small time frame charts such as 5 minute charts. The final picture below shows the forecast line with no top and bottom markers so it can be seen clearly. When the forecast line shows a bottom and the Stochastic of RSI is over sold it is a buy signal. 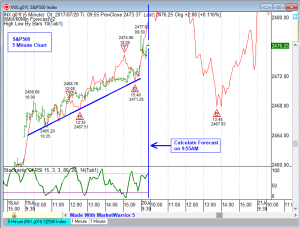 When the forecast line is showing a top and the Stochastic of RSI is over bought it is a sell signal. The picture below shows the Google Finance symbol LNX for the S&P500. This is a 5 minute chart and is a continuation of the chart above. 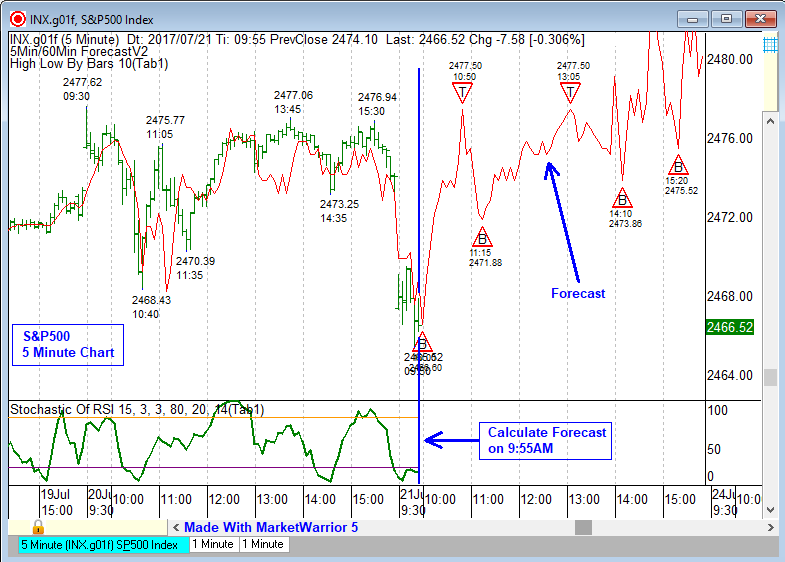 On July 21, 2017 I waited for the main trading session to open to see the opening gap and then calculated the forecast at the same time seen in the previous example which was 9:55AM. I have added a blue vertical line making 9:55AM. 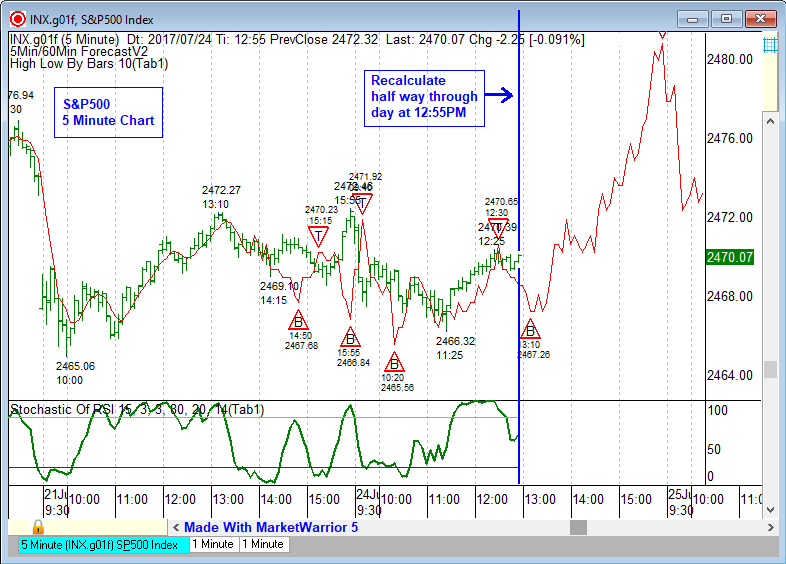 The forecast tool calculates a cycle from the recent historical data and then extends the cycle forward as the red line. The green line in the sub-chart is the Stochastic of RSI indicator. 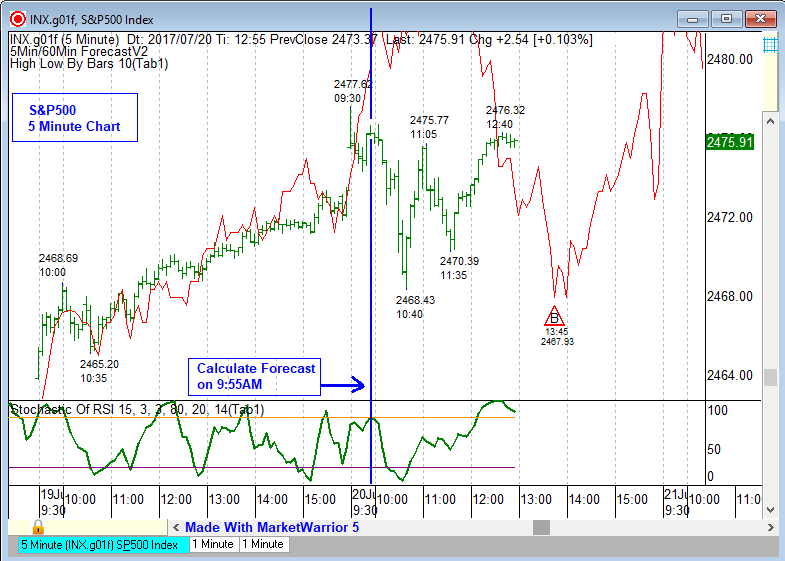 The red forecast line is above the actual price data for July 21, 2017 but the pattern is correct. On this day no recalculation was necessary. The forecast turning points were close to market turning points. 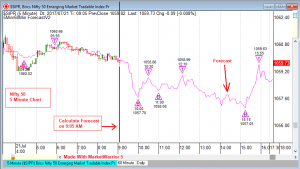 The forecast pattern, trend and direction were similar to the actual market. Below is an example for the S&P500 using the Google Finance symbol LNX. The chart is again a 5 minute chart. I am going to apply the same procedure to using the forecast line. On July 24, 2017 I waited to see the opening gap and allowed a few bars to form. I added the forecast indicator at 9:55AM just before 10:00AM. The forecast line is the red line that extends to the end of the day. 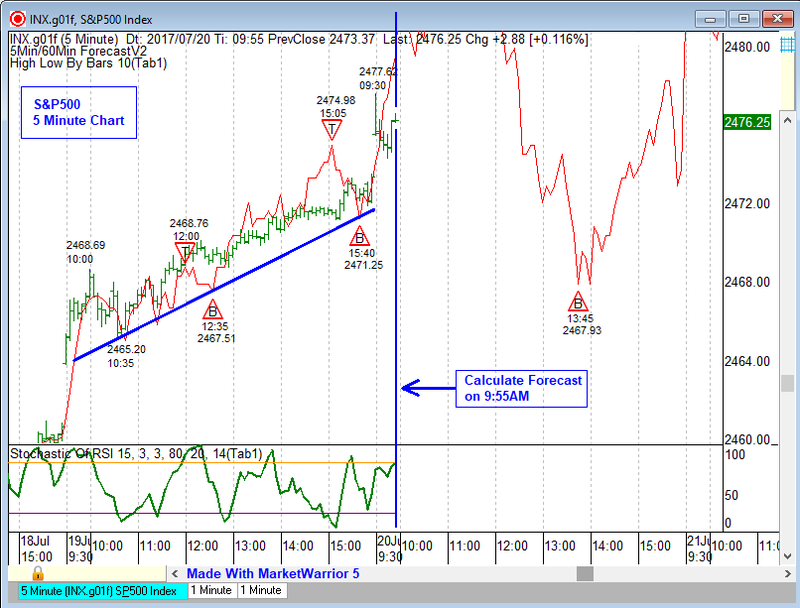 It was apparent by 11:00AM the forecast was errant and was not aligning to the S&P500 price movements. I waited until the middle of the day to recalculate the chart. 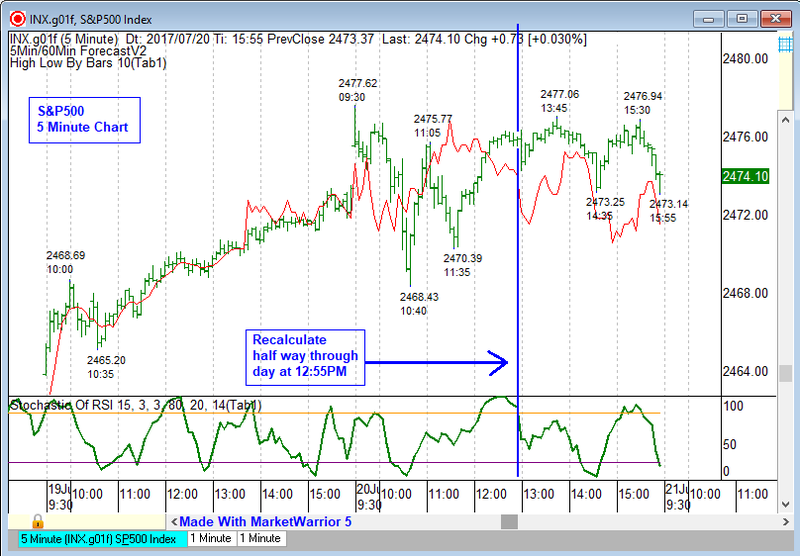 Recalculating at the middle of the trading day usually generates good results but you can recalculate at any time. The picture below shows the forecast after I recalculated it at 12:55PM. This is the same time I recalculated in the previous July 20, 2017 example. Using a starting calculation at 9:55AM and a recalculation time, if it is needed, at 12:55AM seems to work well for the S&P500 chart. The green line in the sub-chart is the ‘Stochastic of RSI’ indicator which works well on the S&P500, 5 minute chart. When the forecast line shows a bottom and the Stochastic of RSI is over sold it is a buy signal. When the forecast line is showing a top and the Stochastic of RSI is over bought it is a sell signal. Below is the final chart for the July 24, 2017 S&P500. The forecast line for the second half of the day shows a rally for most of the time from 1:00PM to 3:59PM with a decline at the end of the day. The red forecast line shows a price swing from low to high that is larger than the actual price swing but the pattern, trend and direction is correct. 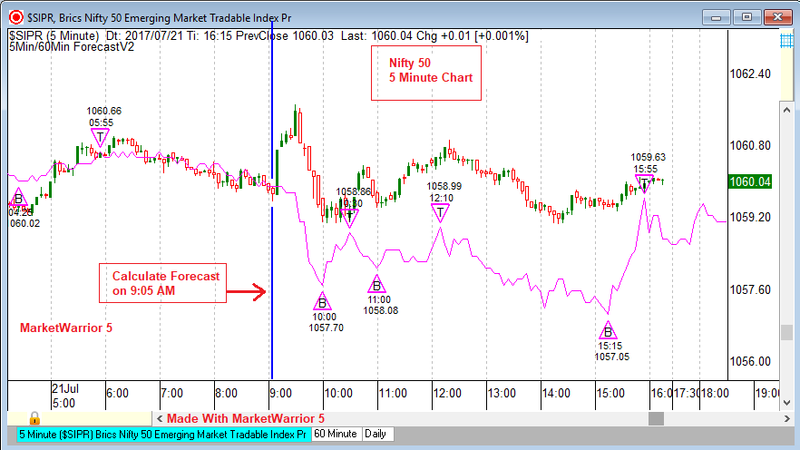 The two pictures below show an example for using the forecast tool on the 5 minute chart for the Indian stock index NIFTY 50. This chart is using the Barchart.com symbol $SPIR. This symbol trades almost 24 hours a day but there is a main trading session that runs from 9:00AM to 3:59PM. 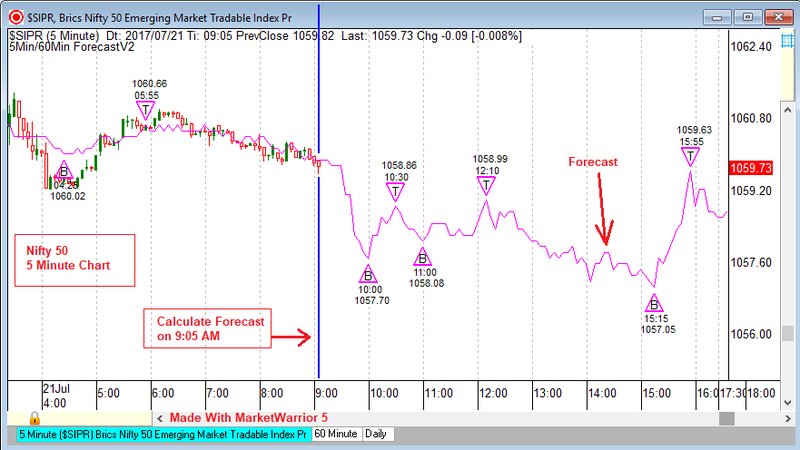 On the chart below I calculated the forecast just after the main trading session opened at 9:05AM. I have added a blue vertical line marking the time when the forecast was calculated. The forecasting tool is calculating a cycle from the recent historical data and then it is extending the cycle into the future. Below is the same forecast as above, but now with the data through the end of the main trading session. This forecast was accurate enough that I would not have recalculated the forecast during the day. 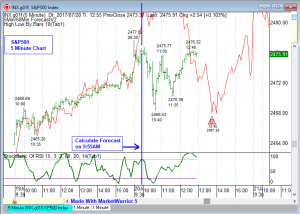 I do not trade the NIFTY 50 but I will try to get more examples showing the forecast tool with the NIFTY 50 because we get a lot of requests for showing this index. MarketWarrior 5.2017.6.16 has added two retracement indicators. These are named ‘ABC Retrace’ and ‘AB Retrace’. The upgrade for the new version can be downloaded in the MW 5 owner’s page. 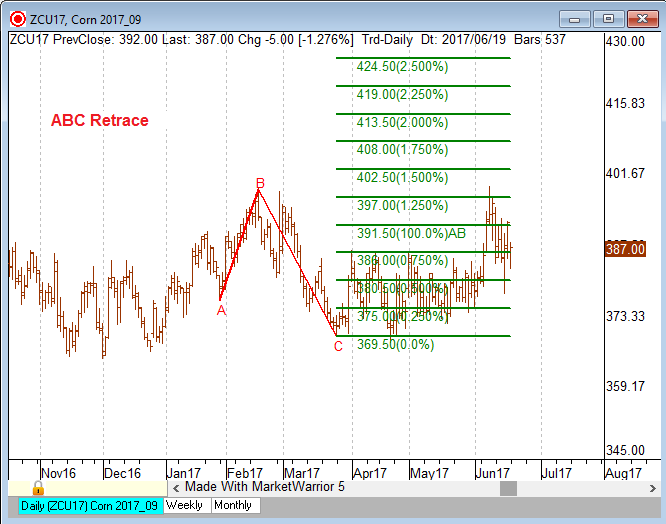 The picture below shows the ‘ABC Retrace’ indicator. This indicator will draw two lines connecting three change-in-trend points. The indicator will then drawn retracement lines. 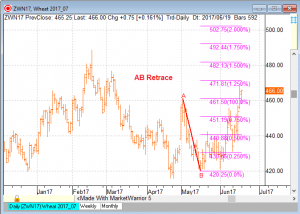 The retracement calculation can be made based on the size of the AB line or the BC line. 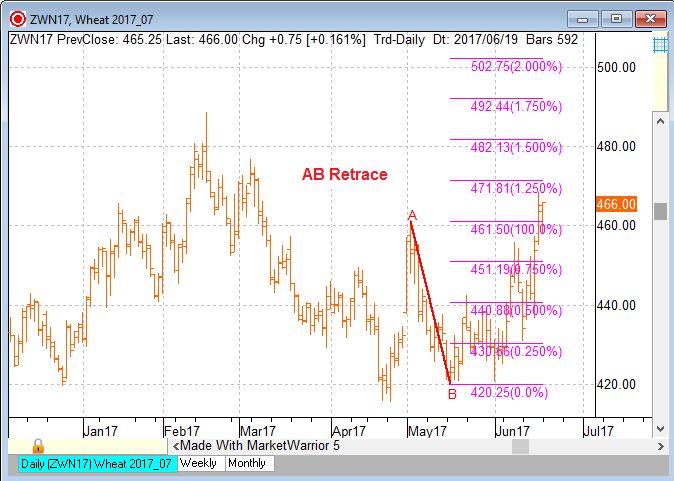 Below is a picture of the ‘AB Retrace’ indicator. This indicator draws a line between two points and then drawns retracement price levels. The company Yahoo Inc. is being sold to the cell phone company Verizon. 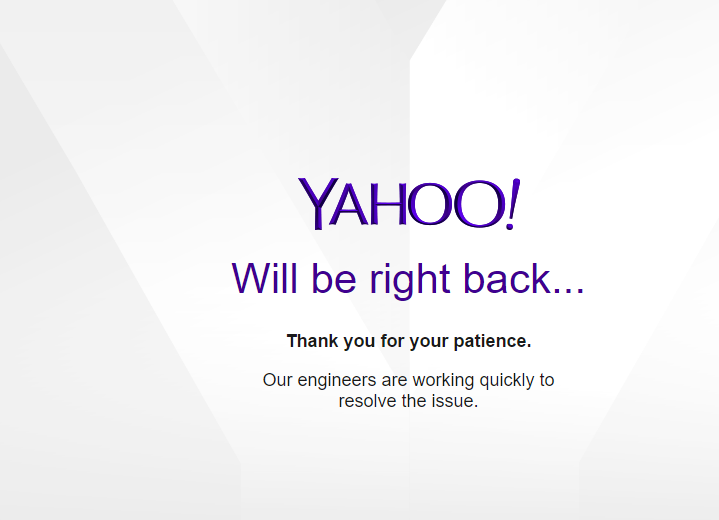 Yahoo Finance has turned off access to all free historical data. We are looking for an alternative data source. 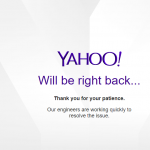 As of right now there is no more free historical data from Yahoo Finance. I believe the data from Google is still available in MarketWarrior 5. 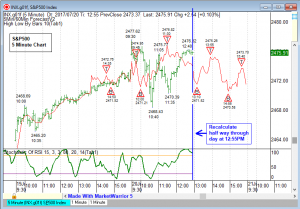 The Master Time Factor automatic forecasts are now available for daily commodity charts. The automatic forecasts have been available for the S&P500 ES futures contracts and now they are available for the following 22 futures: 1)Cocoa 2)Coffee 3)Copper 4)Corn 5)Cotton 6)Crude Oil 7)Feeder Cattle 8)Gasoline 9)Gold 10)Heating Oil 11)Lean Hogs 12)Live Cattle 13)Natural Gas 14)Orange Juice 15)Palladium 16)Platinum 17)Silver 18)Soybeans 19)Soybean Meal 20)Soybean Oil 21)Sugar11 and 22)Wheat. 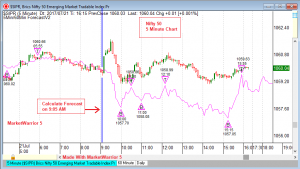 This indicator is now available in MarketWarrior 5.2016.7.5. The free trial is available for download here. The picture below is shows the 5 minute S&P500 emini contract. This is the September contract. 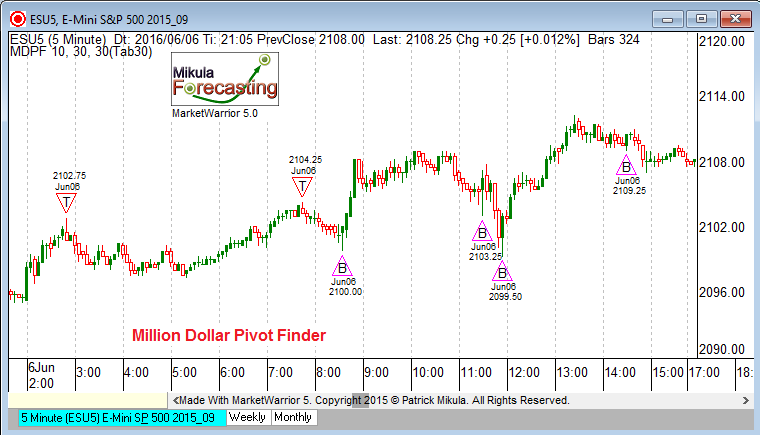 The MarketWarrior 5 indicator Million Dollar Pivot Finder (MDPF) is applied to this chart. This is a zero delay indicator that identifies a change-in-trend. The triangles with the B in the center identify bottom CIT. The triangles with a T in the center identify market tops. These triangles do not move once they appear. The MDPF is now available in MarkletWarrior 5.2016.6.2. There were almost no Change-In-Trend(CIT) points in the overnight market on August 5, 2015. This always makes it harder for MarketWarrior 5 to calculate the cycle that is operating on the 5 minute chart for the E-mini. On August 5 the overnight market basically sloped up with only two minor CIT. 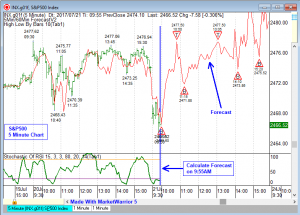 When I am forecasting the E-mini, I like to make the first calculation for the 5 minute forecast before the main trading session opens at 9:30 AM ET. On the chart below, I have calculated the forecast at 9:15 AM ET. I am using the DTN IQFeed and the continuous future symbol @ES#. There are two main sections to this forecast. The first is a forecast bottom at 10:05 AM ET; the second is a rally up to a double top pattern. The double tops occur about one hour apart at 11:40 AM ET and 12:45 PM ET. I have drawn a red arrow labeled A to mark this rally. The second part of the forecast is a decline after the 12:45 PM ET forecast top. After this forecast top, the 5 minute forecast declines for the rest of the day. I have drawn a blue line labeled B, which identifies this decline. 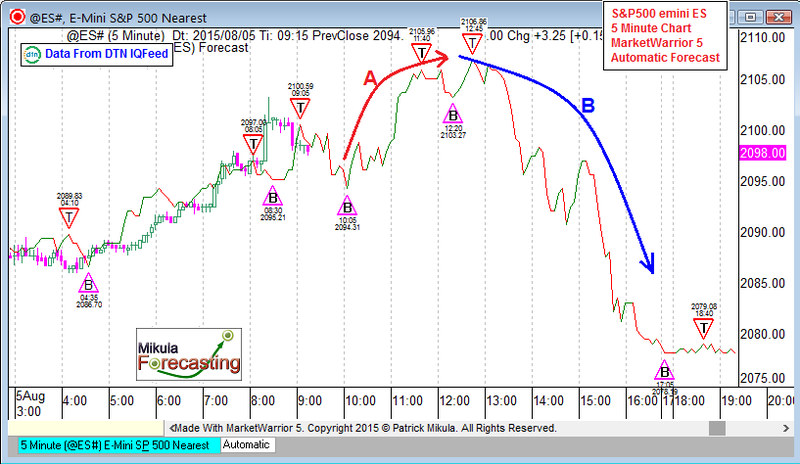 The chart below shows the pattern made by the E-mini on August 5, 2015. 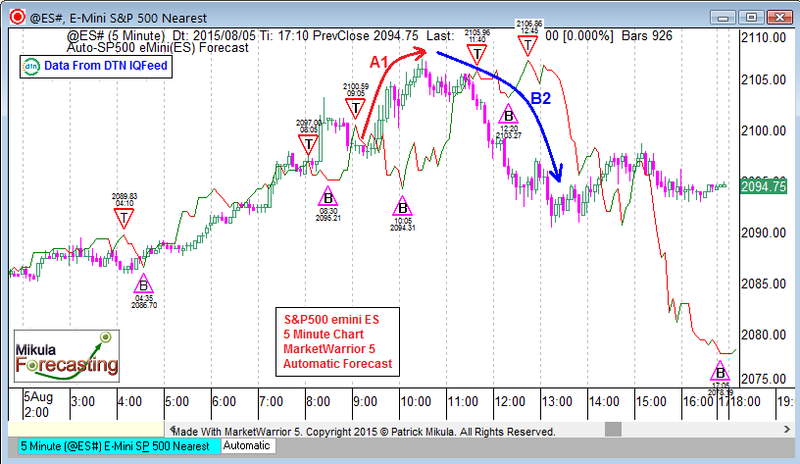 The forecast pattern was correct, but the E-mini made the pattern approximately one hour earlier than forecast. The red line labeled A1 shows the first rally of the day. This rally ran from 9:20 AM ET to 10:30 AM ET. The forecast shows a rally from 10:05 AM ET to 11:40 AM ET. 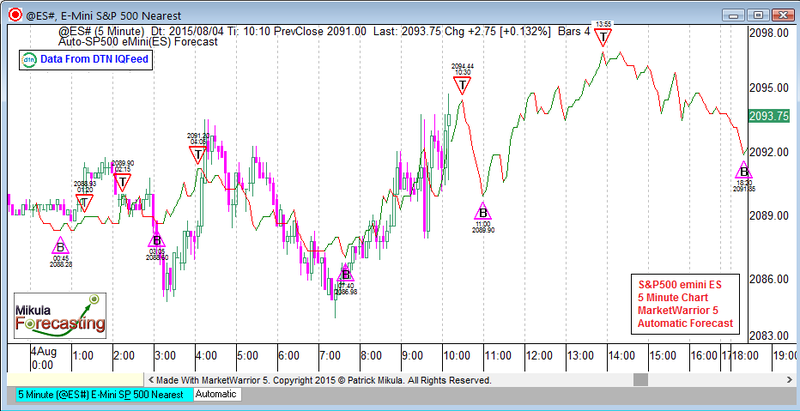 The E-mini made a double top at 10:30 AM ET and 11:25 AM ET. The forecast shows a double top at 11:40 AM ET and 12:45 PM ET. The E-mini then declined after the top at 11:25 AM ET. 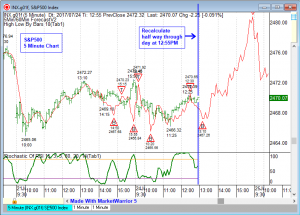 For this day, August 5, 2015, the forecast pattern for the 5 minute E-mini was correct but it was offset from the actual E-mini price action by approximately one hour. 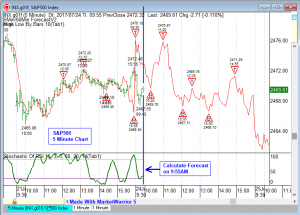 Here is a review of the forecast made by the MarketWarrior 5 program for the 5 minute chart of the S&P500 E-mini on Tuesday August 4, 2015. I am using the DTN IQFeed as a data source. The symbol used is @ES#, which is the continuous E-mini symbol. I had a late start on August 4 and did not begin until after the main trading session opened. The chart below shows the forecast that I calculated at 10:10 AM ET. The main trading session opens at 9:30 AM ET. There were only three Change-In-Trend (CIT) forecast points for August 4, 2015. There was a forecast top just a few minutes ahead at 10:30 AM ET at the price 2094.44, then a bottom at 11:00 AM ET at 2089.90. Finally a top was forecast for 13:55(1:55) PM ET. 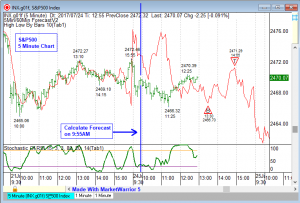 This forecast looked very good because the over night session had large tops and bottoms that could be used by MarketWarrior to calculate the E-mini cycle. When the overnight session is flat, calculating the market cycle can be difficult, but on August 4 there seemed to be a good amount of volatility in the over night market. The second chart shows what happened during the day. 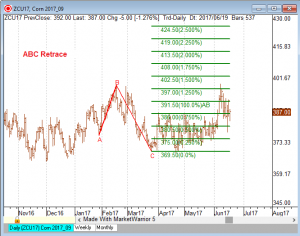 On the chart below, I have labeled the three forecast CIT points as A, B and C. The forecast top at 10:30 AM ET was very accurate in both price and time. The actual top came at 10:25 AM ET. This is labeled A. The forecast labeled B was for a bottom at 11:00 AM ET and again this was very accurate. The actual bottom came at 10:55 AM ET. The third forecast CIT, labeled C, was for a top at 13:55(1:55) PM ET. The actual top came early at 13:30(1:30) PM ET. 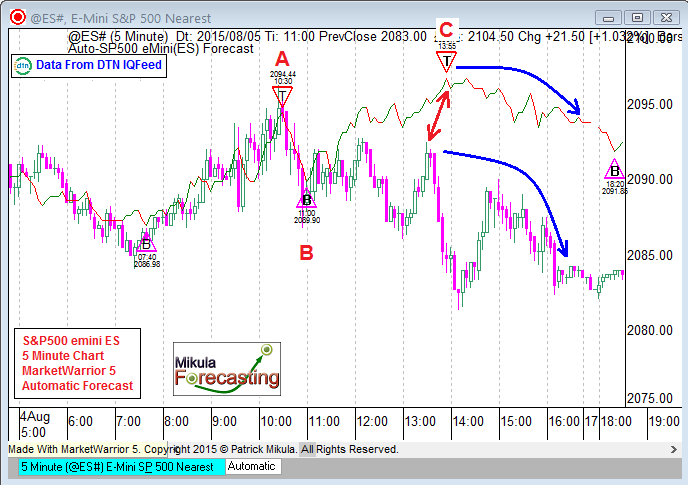 On the chart below, I have drawn a red arrow connecting the forecast top C and the actual top in the E-mini. 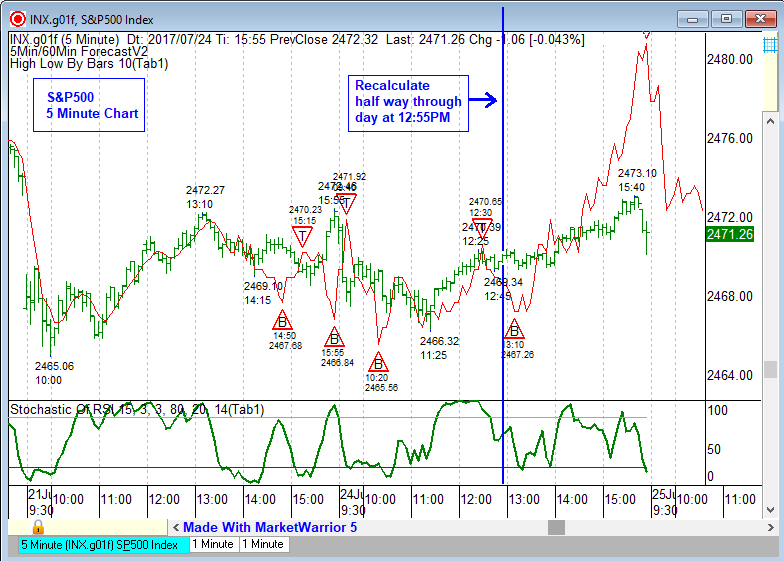 After the top at C, the market followed the forecast pattern and declined for the rest of the main trading session. 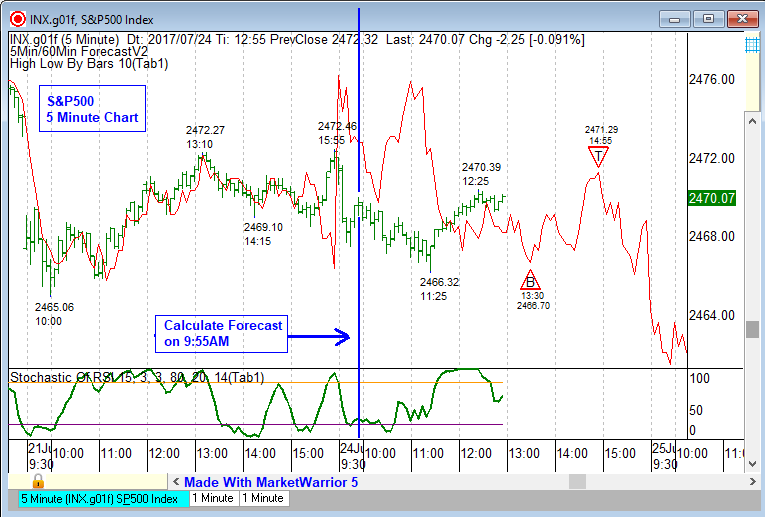 If you think this forecast would help you trade the E-mini there is a free trial for both MarketWarrior 5 and DTN IQFeed. You can click here and here to learn more.